Keep your dog healthy and looking majestic with regular bathing! Exercise, quality food, and access to clean water are all critical to your pet’s health and happiness, but did you know that regular baths can be just as important? 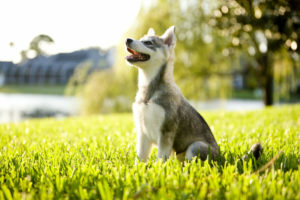 There are many different beliefs about how often you should bathe your dog, and a vet’s opinion may be worth obtaining if you notice any skin issues, but in general, most dogs just aren’t getting groomed often enough. Regular bathing promotes canine wellness in several different ways, four of which we’ll be discussing here. While not all dogs find baths to be a relaxing time, for some it’s a great way to get in some quality bonding time. A warm bath can be just like a massage and spa session for your pooch, and if they enjoy the process, it’s a great way to show you appreciate them. When you give your dog regular baths, you will be more likely to notice and address any issues such as skin conditions, fleas, scrapes, and more. Plus, it can help improve the health of you and your human family as well. Regular bathing helps to reduce the amount of dust, dirt, dander, and pollen your pet brings into the house; this reduces the number of allergens introduced to your home and helps to improve respiratory health. The skin on your furry friend has pores just like yours does. Over time, these pores can become clogged and dirty, in some cases your dog may develop skin problems because of deeply clogged pores. With regular bathing, you can ensure that your dog’s skin is in excellent condition leading to fewer instances of inflammation and irritation. Keeping your dog free of dirt, fungus, fleas, and odors isn’t just great for them; it makes you happier to be around them too. Adding conditioner, in particular, is an essential step for winter grooming. With the dry, cold air, the skin of your pet can become itchy, using conditioner and ensuring that excess dead skin is exfoliated away will make you and your pooch much happier. This entry was posted on Friday, March 22nd, 2019 at 3:50 pm. Both comments and pings are currently closed.